As technology evolves, every household is predicted to have at least one robot in the future, just as many of today’s consumers feel incomplete without Internet access or a mobile phone. That’s the future envisioned by Honda Motor Co., and with the progress being chalked up by Asimo, its humanoid robot, such an era is approaching. 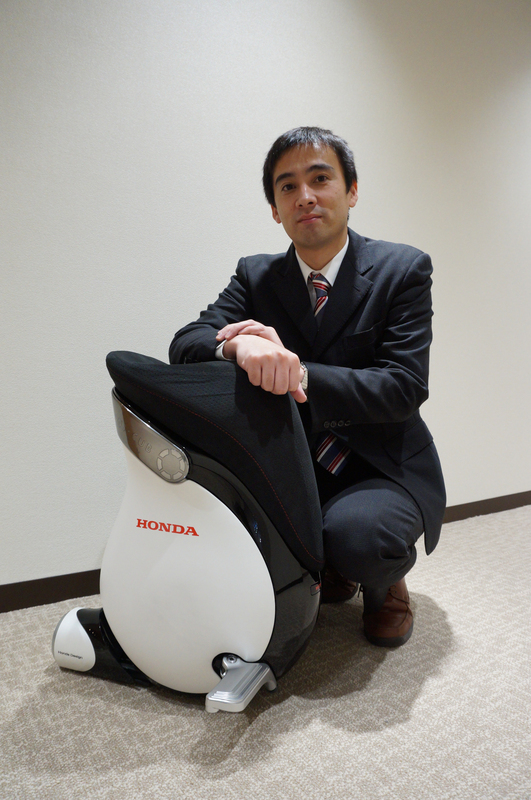 Honda is using its robotics prowess to seek new possibilities in human mobility. These include one-person vehicles and machines that help people walk. 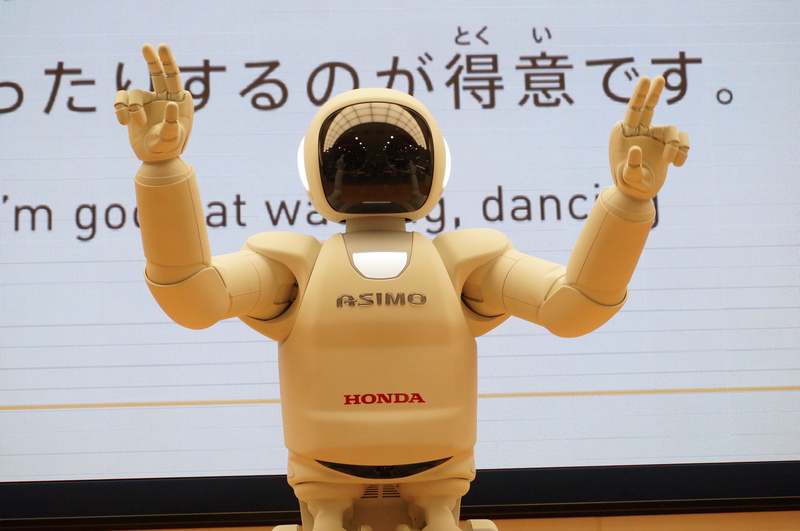 Honda unveiled Asimo in 2000, but its robotics technology dates back to 1986. “If we have such robots that can take care of small things for humans, I think it will change people’s lives,” said Satoshi Shigemi, senior chief engineer at Honda R&D Co.
Shigemi said assistant robots should be able to handle small daily chores, like putting dishes away or folding laundry. This goal is still years or maybe even decades away, but Asimo, standing just 130 cm tall and weighing 48 kg, has been evolving. When Asimo debuted in 2000, its main feature was mainly the ability to walk. Later, it was given the ability to recognize voices, faces, run (at 9 kph), jump and carry things in its arms. In 2011, Asimo even acquired “autonomous behavior control technology,” which allows it to make its own decisions, depending on the situation. For instance, when Asimo detects several people approaching from different directions, it predicts their paths in order to avoid bumping into them. While these might be easy things for people to carry out, “it’s technologically really difficult to make robots do what humans naturally do,” Shigemi said. Thus, improving Asimo’s hardware and mobility is still a must, but Shigemi said the ability to make its own decisions and adjust to various situations is crucial. “I think we already have the technology that enables robots to do what they are told to do. But the important thing is for robots to sense people’s intentions and make their own decisions on doing things. Otherwise, they won’t become truly useful,” Shigemi said. This is probably feasible, although the scenarios would be limited. For instance, robots could work at train stations and interact with customers in various ways, such as by telling them which trains to catch when, and how to buy tickets. 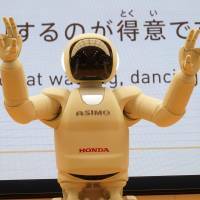 He said it is difficult to predict when Honda will actually be able to provide robots for practical use, but since Tokyo will host the 2020 Olympic Games, the firm hopes to demonstrate what Asimo and its robotics technologies can really do at that time. When people view Honda’s Uni-Cub for the first time, for example, many would have a hard time believing it’s a vehicle. That’s because it looks like a stool that appears to fall over when someone sits on it. Anyone’s doubts would grow once they are instructed to “drive” the Uni-Cub just by sitting on the saddle and shifting their weight. But the ride is surprisingly smooth whether the Uni-Cub is going forward, sideways or diagonally. Once riders get the hang of riding on Uni-Cub, which has a maximum speed of 6 kph, they feel they are moving naturally without thinking about it. That is one of Honda’s main aims — to make riders feel they are moving in harmony with the environment. “The keyword is a pedestrian. People are riding on the Uni-Cub but are still able to act like pedestrians,” said Shinichiro Kobashi, chief engineer of the Smart Mobility Development Division at Honda R&D. Honda uses some tricks to make Uni-Cub riders feel like they are pedestrians. For instance, even though it is a sitting-style vehicle, unlike the Segway, eye level for most riders remains quite high, although the rider must be at least 155 cm tall to use it. This makes it easier and more natural to talk to people who are standing nearby. This is different from using a wheelchair, which tends to make people feel like they’re being looked down upon. Also, Uni-Cub is designed so that the rider must execute a U-turn to move in the opposite direction. This is to take into account the fact that people hardly ever walk backward, Kobashi said. To move forward, numerous small wheels come together to act as one big wheel. To move laterally, the small wheels kick in and slide. There is also a small wheel behind the combined big wheel that makes for smoother turning. But the Uni-Cub’s odd appearance — it looks something like a unicycle — often raises the question: How does it stay upright? Kobashi explained that the vehicle uses the same tactics people use when trying to balance a stick vertically in the palm of their hand. Most people would rapidly move their hand back and forth to keep the stick standing. The same thing happens inside the Uni-Cub as its computer brain instructs the machine to keep its balance. It is currently illegal to drive a Uni-Cub on public roads in Japan because it doesn’t fall into any vehicle category. To promote its use, marketing should begin in places like shopping malls, amusement parks or museums where walking might be considered a chore, said Kobashi. Another new form of mobility being developed with robotics technology is a device to assist a person’s walking through an apparatus worn around the waist and thighs. 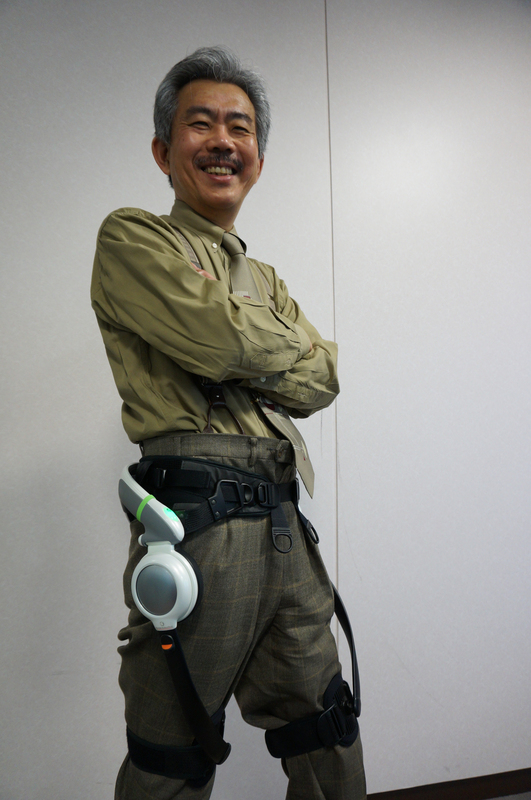 The gadget’s waist belt is equipped with a computer and battery to operate the thigh sections, which are equipped with small motors that give the wearer’s legs a little push with each step. 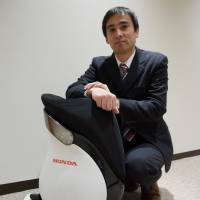 Around 1999, “we started brainstorming about whether we could create something useful for the upcoming aging society with our robotics technology,” said Hideaki Takahashi, chief engineer at Honda R&D. “The No. 1 thing people need to continue living independently is to be able to walk. We had the technology to make robots walk, so we started developing this technology (further) by taking advantage of it,” said Takahashi. But the research did not go as planned. Takahashi said Honda first tried to make a walking assist device that would depend nearly entirely on the power of the machine. In that case, the machine would need a motor powerful enough to move people’s legs, as well as a large battery. One prototype they came up with weighed about 30 kg, which was unrealistic for practical use, Takahashi said. But the engineers later realized that the machine would not have to be that big if its sole purpose was just to help people move their legs. This helped make the device considerably lighter, and it now weighs in at about 2.6 kg. 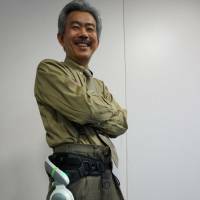 According to Takahashi, it is still unclear when Honda will be able to launch the walking assistant, but it has provided the machines to hospitals for experimental purposes in the field of rehabilitation both in Japan and the United States. Takahashi said the machine can help paralyzed people who can still move their legs walk more smoothly. It also works well with the elderly and healthy people by helping them walk with an appropriate rhythm. This section on the second Monday of each month reports on new technologies under development expected to hit the market in the near future.